As of this writing, there are 2,595 customer comments and 194 answered questions for the Greenworks Amp Single Speed Electric Blower. I have read the customer feedback and then condensed the result into this review. I hope that this review helps you when shopping for the best leaf blower to maintain your yard. The Greenworks Amp Single Speed Electric Blower plugs in and uses a 7-amp motor. 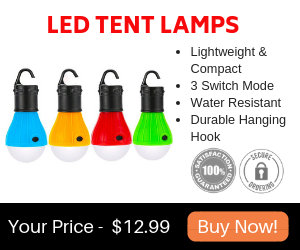 Keep in mind that it does not come with a power cord, so you will need to use your own extension cord. It can reach speeds of 160 MPH to blow grass clippings and leaves in piles. The blower tube comes in two pieces and measures 20 inches long. A 4-year manufacturer's warranty is provided. This leaf blower is very lightweight, as it weighs in at just 4.58 pounds. The CFM is 530. You usually don't find out how good or bad customer service is until something goes wrong. With that being said, the majority of comments about customer service were very positive. One customer reported, "Like with many other buyers, the first one I bought worked for five minutes and then died, leaving a smell like burned carbon bushings (I suspect the cause). But it was easy with Amazon to return the item AT NO COST with one click. They contacted UPS and the next day the UPS man stopped by with a shipping label and took the piece back. All I had to do was print out a packing slip and put it inside the box and re-seal it with tape. Three days later, a new one arrived that worked great. Why did the original fail? Infant mortality and burn-in. At this price, they cannot afford to run these for an hour to test them to make sure they don't fail due to what we call "infant mortality" in the EE world. So the odds of getting a 'bad' one are somewhat higher, but the return policy is so painless, it is not a big deal." 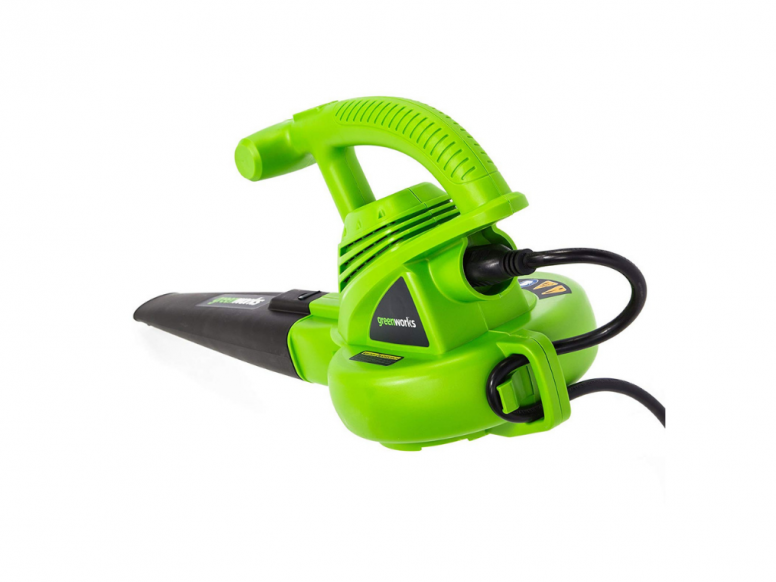 The Greenworks Amp Single Speed Electric Blower is powerful for it's size and price. One person said, "Just super .. I use it to blow leaves etc. out of my garage and all the nooks and crannies where they hide. Really surprised and pleased with the power. What used to take an hour plus with brooms now takes minutes. 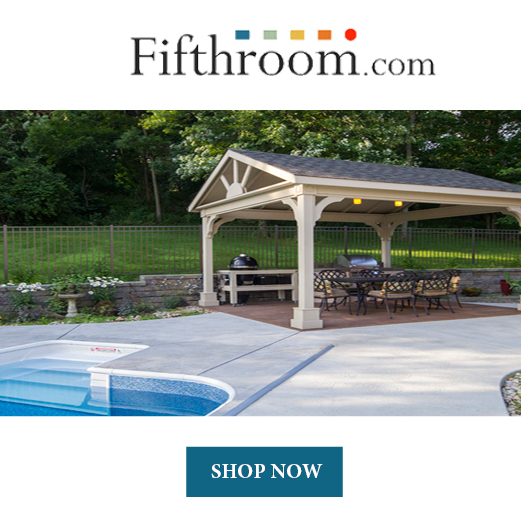 And when I was looking for blowers this (quality made) was inexpensive." For what you are getting this leaf blower is priced well. The Greenworks Amp Single Speed Electric Blower is not one of those top of the line leaf blowers, but it also isn't expensive. A customer explained it like this, "I've seen people write negative or just mediocre reviews for items like this. Items that are very inexpensive so don't come with the bells and whistles of other, more expensive models. Well, this blower is insanely strong period. I'm sure other models out there are stronger but I wasn't paying for the ability to clear leaves from my town, just my yard. And does this thing ever get the job done. Used it on wet leaves early in the morning so it was put through its paces and it exceeded my best case expectations for the product! Giving this thing only 5 stars feels criminal." The Greenworks Amp Single Speed Electric Blower only weighs 4.58 pounds. This is a nice feature because it means you will be able to do more work with less effort of lugging something heavier around. If you want to blow leaves out of a gutter, it will be much easier with a lightweight leaf blower than with something heavy. Also, if you are older, or not as strong as you used to be, the lightness of this leaf blower may be a big selling point for you. 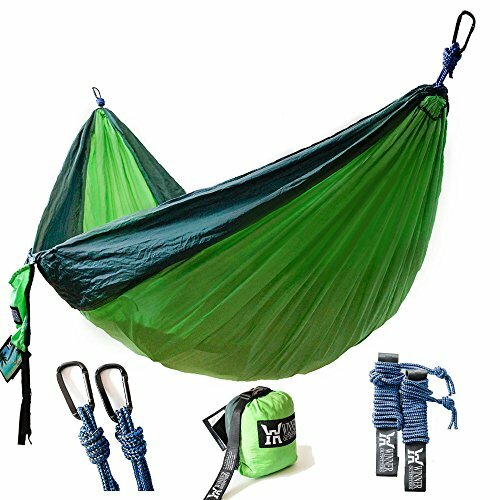 A customer said, "I needed something lightweight and easy, this was the choice. It was so helpful in getting between the nooks behind the grill, AC condenser and behind the bushes. It was quiet and simple to operate. Couldn't be happier, in fact, I just ordered one for my 90 years young Mother." Unfortunately, a cord is not included with The Greenworks Amp Single Speed Electric Blower. This is not a good selling point since some electric leaf blowers do come with a cord. Also, with this being a corded leaf blower, you will have to contend with the cord and making sure it doesn't become unplugged. A customer said, "Obviously the cord thing becomes annoying. Snagged or tangled up or unplugging. Could use some sort of 'cord-to-cord' locking mechanism. So I duct taped them together. The black extension kept falling off so I had to duct tape that too....after the fourth or fifth time." More than one person complained that the extension cord would not stay in the plug. Some people had to resort to taping it to keep it on. One customer said, "Only thing negative I can say about the kidnapped victim, is that the female end of any extension cord I used for it would not stay connected firmly, and it would shut in and out with any sort of movement without taping it tight. (Which, didn't really bother me as I had a cord that I kept attached to it, so didn't notice it once they became one.)" This is a loud leaf blower according to the majority of customers. It won't be as loud as most gas-powered leaf blowers, but for an electric blower, it is very loud. A customer said, "Be warned, this blower is fairly loud. I recommend you use some sort of hearing protection. Also, it would be nice if there were some clip or harness to secure my extension cord to the blower's power cord (my lawnmower has such a clip) to avoid pulling out the cord while using the blower. But no big deal, wrap the extension cord around the blower's cord a few times and the problem is solved. In short: the pros are many, the cons are few, the price is excellent. Buy it." Another one said, "Also at full blast it’s LOUD. Has that jet turbine type sound." The Greenworks Amp Single Speed Electric Blower comes with a strap. However, some people felt that the strap didn't work too well. One customer said, "Lots of power blows those leaves to Timbuktu! The strap doesn't work very well, so I ended up just holding it and it gets heavy/bulky after a while. But since it works so well you don't need to carry it for long. There is a bit of a push in the back (it wants to move forward) so you have to really hold on. I have several large eucalyptus trees planted behind my home (HOA won't cut them down) and there's a constant supply of bark, leaves, branches, seeds, and pollen that fall throughout the year. This blower will make the patio livable again, so thanks GreenWorks!" The Greenworks Amp Single Speed Electric Blower uses a 7-amp motor but it does not come with a power cord, so you will need to use your own extension cord. 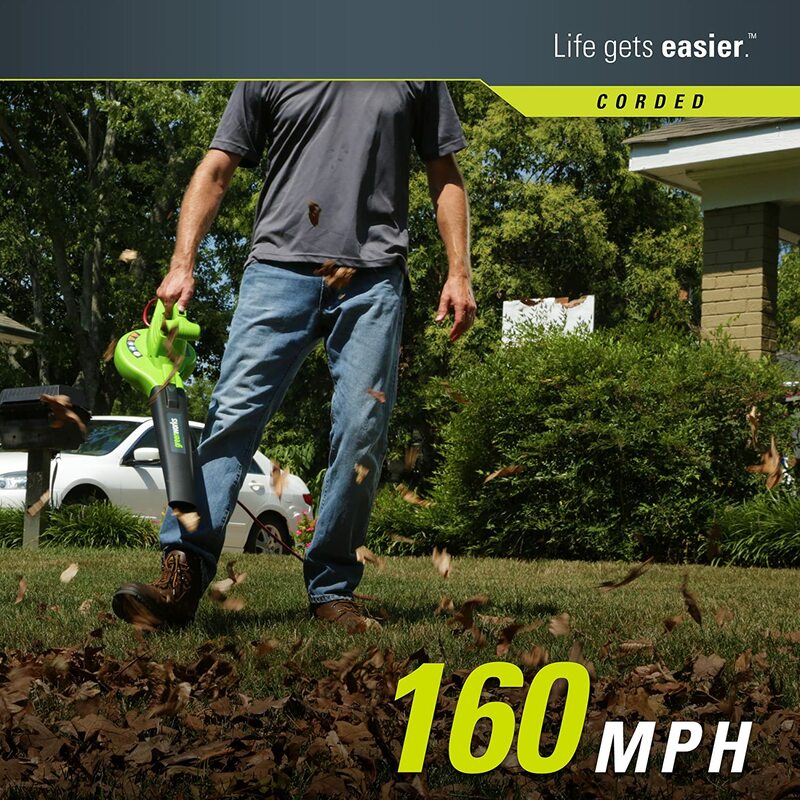 This leaf blower can reach speeds of 160 MPH. The blower tube comes in two pieces and measures 20 inches long. A 4-year manufacturer's warranty is provided. This leaf blower is very lightweight, as it weighs in at just 4.58 pounds. The CFM is 530. For the low price, you will be paying for this leaf blower, it is a great buy for what you get. It's not going to be as powerful as a large gas-powered leaf blower but in return, you don't pay as much, and it's lighter in weight. Unfortunately, this leaf blower is fairly loud especially for an electric blower, which is normally quiet. Other than that, this is a good buy for what you get. Here are some top questions that I found for people considering buying the Greenworks Amp Single Speed Electric Blower. Will this work for blowing small amounts of snow? This unit has a velocity of 160 MPH. The leaf blower will blow light snow off of cars or other small areas. However, be careful when using this unit in wet conditions and to be mindful of possible electrical dangers. Will this work on pine needles in the grass? Yes, it should work well on pine needles in the grass. How heavy is this leaf blower? This leaf blower weighs only 4.58 pounds. This is very lightweight compared to other leaf blowers.